Cygwin’s great for getting some Linux command-line goodness in Windows, but using the Windows Shell to access it kills some of that magic. Using Mintty and a few other methods, you can make the experience much more luxurious. Can’t efficiently change font faces or sizes on-the-fly. Scrolling via the keyboard doesn’t work. Selecting text over multiple lines doesn’t work. With some configurations, selecting text at all doesn’t work. It’s all sorts of ugly compared to what Linux terminals provide. A useful tool that’s a chore to utilize doesn’t really take me very far. How about you? 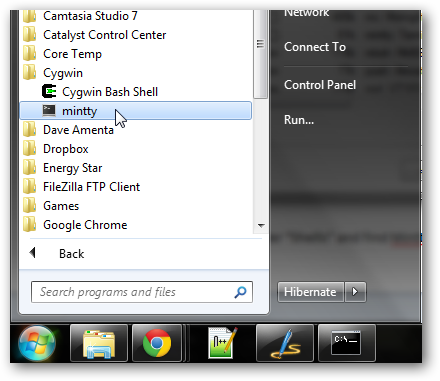 Mintty is a great alternative shell for Cygwin that provides a host of useful features and alleviates the above problems. If you use MSYS/MinGW instead of Cygwin, Mintty works beautifully with that, too. You can install Mintty by grabbing it from the project’s download page (make sure you get the proper version for your setup! ), or you can just run Cygwin’s Setup.exe file again. 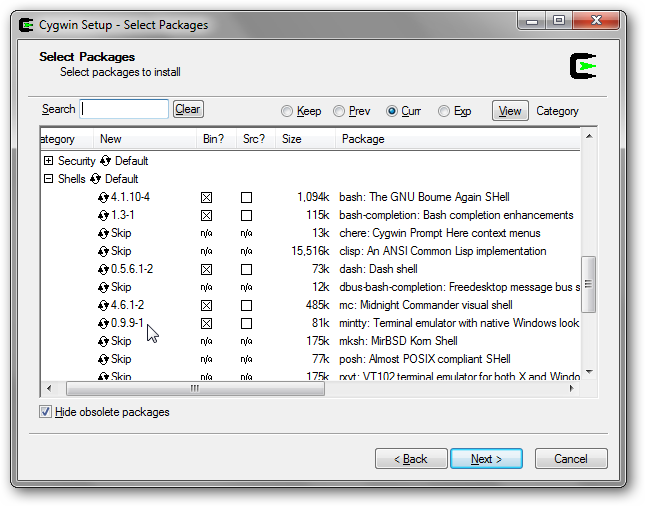 At the Select Packages screen, look under “Shells” and find Mintty. Click where it says “Skip” and hit the Next button. Once you’ve finished installing it, you should be able to go to Start > All Programs > Cygwin > mintty to launch it. First thing I did was change the window transparency and the cursor in the Looks tab to something I’m more familiar with. Head over to the Text tab when you’re done that. 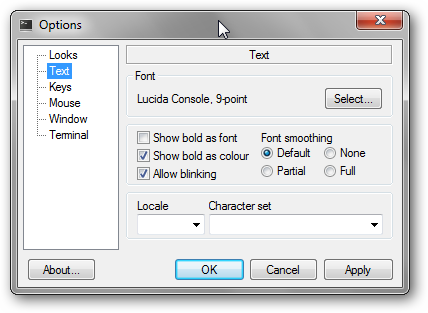 You can change the default font, of course, but also the Locale and Character Set to something different from what Windows is using right now. 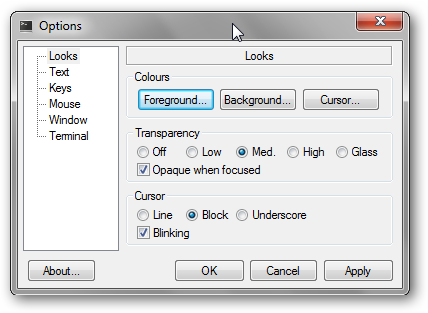 You can also play with font smoothing if your monitor shows it a little too jaggedly. 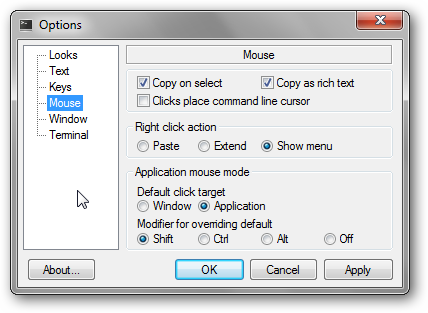 Under the Mouse options, you’ll be able to change your mouse interaction settings, such as copying and pasting. 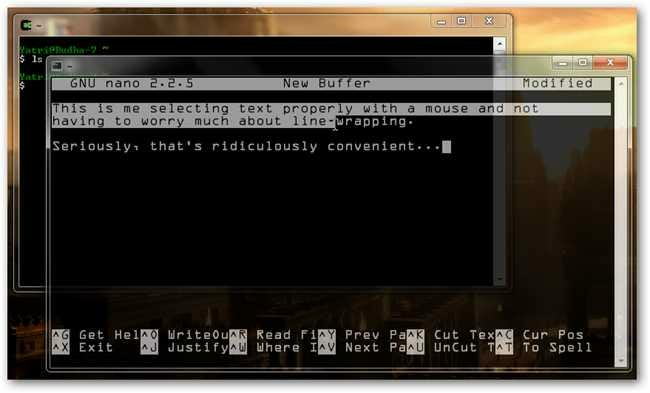 You can also easily make the mouse place the command-line cursor, something that vim users often seem to like. Lastly, click on Window. 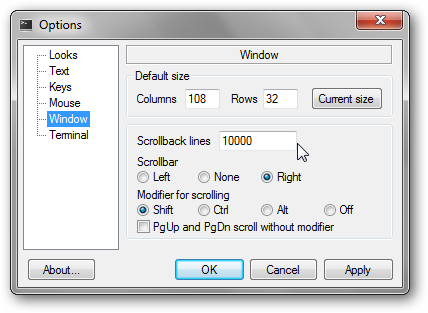 Here, you can change the default terminal size, the scrollback buffer size, and choose a modifier for scrolling with the arrow keys. 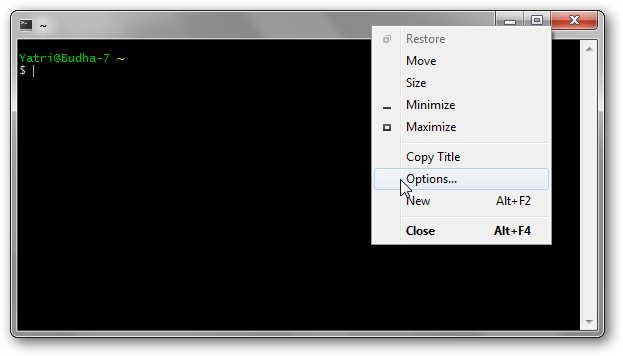 By default, Shift+Up/Down will scroll through the buffer in the window. Now here’s what my modified Mintty configuration looks like. Mintty is great, but others may not like it so much. We showed you how to install an SSH server on Cygwin, and many people use PuTTY or KiTTY to connect to Cygwin that way. However, if you don’t want to set up SSH access, there’s an easier way. PuTTYcyg is a patched version of PuTTY that is able to connect to native Cygwin installations. There’s only one hitch: PuTTY was recently updated to version 0.61, adding support for Windows 7’s jump lists, Aero-resizing, and non-fixed-width fonts. PuTTYcyg hasn’t been updated yet, so you’ll have to choose between Cygwin support and Windows 7-compatibility. I haven’t been able to find the patch itself, so I haven’t tried adding support to the latest version of PuTTY. If you have, please leave a line in the comments. Personally, I prefer KiTTY over PuTTY because of it’s more customizable and was updated more often over the past 4-years. There’s a KiTTY-compatible PuTTYcfg patch which adds this functionality for others like me. To be honest, though, since I started using Mintty with Cygwin I haven’t touched KiTTY in weeks. Lastly, if you’re looking for something that supports Cygwin as well as the Windows Command Prompt, you might be interested in Console. It’s a console replacement that allows tabbing of multiple types of shells as well as adding transparency and on-the-fly font changes. Do you have a preferred Cygwin shell? Do you have an alternative to Cygwin? Know of a patch that works with PuTTY 0.61? Let us know below!